The SPLC submitted hundreds of pages of expert reports to a federal court as part of a motion to certify a lawsuit against the East Mississippi Correctional Facility as a class action. The reports expose shocking human rights violations at the for-profit prison for the mentally ill, including conditions described as “torture” by a forensic psychiatrist. A prisoner at the East Mississippi Correctional Facility (EMCF) told the counselor that his heart was hurting and that he didn’t have a reason to live. He was also having hallucinations. As the counselor met with the prisoner in December 2013, he noticed that the man was attempting to cut himself with a small, dull object. There was also a long rope around the prisoner’s neck. The counselor reached a conclusion: This prisoner is not in distress. The counselor then simply walked away. 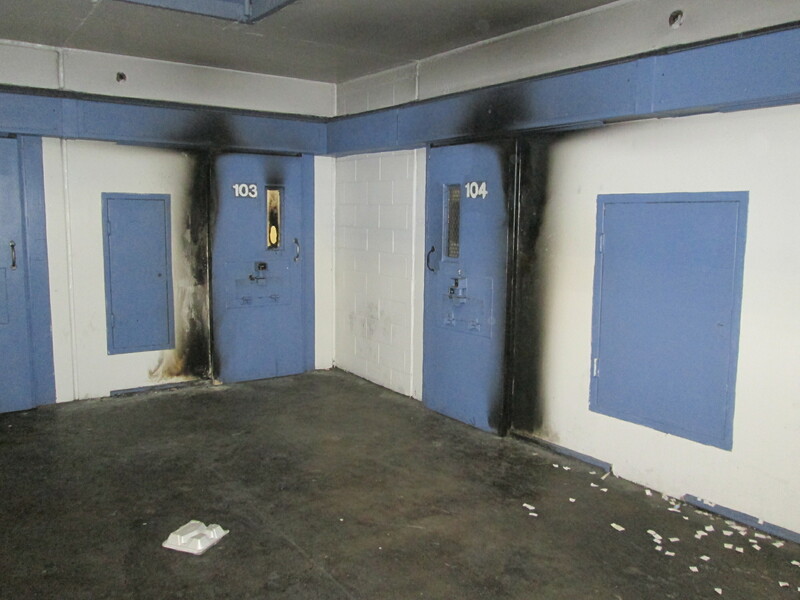 The prisoner eventually resorted to a tactic that others at this privately operated, for-profit prison use to get help: He set fire to his cell. Two days later, he was found dead in his cell – the apparent result of a heart condition the staff at the Meridian, Mississippi, prison rarely took seriously. And it appears that attitude at this prison – home to many prisoners with mental health needs – never changed, if an entry in his medical chart is any indication. The entry showed that his vital signs were stable. He had been dead for 10 hours at that point. The SPLC in 2013 sued the state over conditions at the prison and yesterday filed a motion to certify the suit as a class action. If certified by the court, the lawsuit would benefit all prisoners at the facility, including the majority who have serious mental health needs. The American Civil Liberties Union, the Law Office of Elizabeth Alexander, and Covington & Burling LLP are serving as co-counsel. The original lawsuit describes a nightmarish, violent prison where lights and toilets often don’t work, prisoners rarely see sunlight and go without showers for weeks, and floors and walls are covered in feces, blood and urine. The prison is operated by Utah-based Management and Training Corporation, which describes itself as the country’s third-largest operator of private adult correctional facilities. Health care is provided by Health Assurance LLC, based in Jackson, Mississippi. The motion filed in the U.S. District Court for the Southern District of Mississippi, Northern Division, includes hundreds of pages of expert reports that give a glimpse into a dangerous and filthy prison that left experts aghast. Eldon Vail, former secretary of the Washington State Department of Corrections, also found the conditions in segregation to be deplorable. The dysfunction at this prison literally hangs in the air as the smell of smoke wafts out of segregation units where prisoners have set fires. Thick cell doors are scarred with scorch marks. When Vail visited the facility earlier this year, he found a “smoldering pile of debris in the middle of the day room floor.” Another expert found makeshift wicks in the cells, possibly the only tools prisoners have to get prompt attention from officers. Emergency call buttons in the cells are either broken or unreliable. Even when prisoners get the attention of the staff, it’s unlikely they’ll get the help they need. There are numerous stories of prisoners struggling to get medical care. This dysfunction is clear even in a small sampling of prisoner experiences. A 28-year-old prisoner lost vision in his right eye when he didn’t receive his glaucoma medication. He was already blind in his left eye. A doctor failed to respond to a prisoner’s repeated requests to discuss an ultrasound showing a testicular mass. The 25-year-old prisoner has metastatic testicular cancer. A 64-year-old prisoner with schizophrenia and tuberculosis infection was found to have diabetes in 2012, but the doctor did not review the prisoner’s lab reports or see the patient. The prisoner’s diabetes was untreated as of April 2014, and his vision has deteriorated. A 55-year-old prisoner wasn’t sent to the hospital for days after correctional officers used force on him. It wasn’t until he started having seizures that he was sent to the hospital and diagnosed with subdural hematoma from head trauma. Other prisoners may be going without treatment because of the copay they are charged for sick call requests. Often, prisoners pay copays for sick call requests that don’t result in a consultation with a nurse or doctor. “There were numerous incidents in the records I reviewed that documented patients in distress over mental health and psychotropic medication issues but declined to write a sick call request because of the co-pay they would be charged,” Terry Abplanalp, chief psychologist of the Washington State Department of Corrections, wrote in his report. The reports raise other issues as well. For example, a prison van is often used to transport prisoners to the emergency room, even in instances when an ambulance is needed. During the first 10 months of 2013, the van was used in 125 of 168 trips to the emergency room. That means during those 125 trips, the private contractors did not have to pay for an ambulance. “Based on the cases I reviewed, many of these transportations by van were dangerous and placed the inmates at risk,” Dr. Stern wrote. Prisoner medical records are another concern. One expert compared the medication records to “Swiss cheese” because there are so many holes. Entries documenting rounds by personnel frequently appear to be nothing more than a summary stating the prisoner is fine that has been repeatedly copied and pasted. “I found, almost literally without exception in each of the mental health charts I reviewed for patients with serious mental health needs at EMCF that their charts were grossly incomplete, unreliable, and in many cases with entries that were apparently fabricated,” Abplanalp wrote. Vail reviewed video of such incidents, including an encounter where a prisoner was speaking to corrections officials through the tray slot of his cell door. As the prisoner complains about being “treated like a dog,” an officer sprays his face with pepper spray. “Such a ‘sneak attack’ completely destroys any trust the inmate might have in speaking with mental health staff and will likely make the prisoner much harder to manage in the future,” Vail wrote. In another video, a prisoner warns officers that another prisoner has asthma. He is sprayed anyway. The wheezing prisoner collapses on the day room floor. The prisoner, whose T-shirt is already spattered with blood, coughs blood onto the floor. “This incident illustrates a complete callous disregard for the health and safety of the inmate who was suffering from the effects of the gas and illustrates the risk of substantial harm for every prisoner in the facility,” Vail wrote. Even without these issues, the prison is a dangerous place. A December 2013 video reviewed by Vail demonstrates that cell doors can’t be counted on to work. It shows an officer attempting to place a prisoner in three different cells with broken locks. “This sequence would almost be comical were it not for the serious risk of harm unsecure cell doors present to the prisoners,” Vail wrote. Vail also found the prison to be filthy. Inmates within a segregation unit are apparently instructed to throw their Styrofoam meal trays through their tray slot after eating. 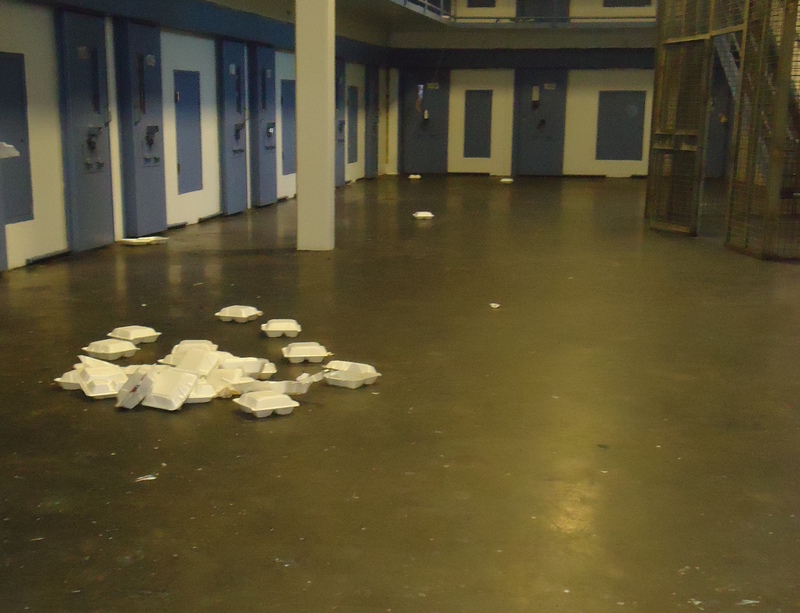 The trays land on the day room floor, which may explain why prisoners complain of rats. Prisoners also appear to live for weeks or months in dark segregation cells with broken or missing light bulbs. Broken lights were even found in the shower area, forcing prisoners to bathe in dark and dangerous conditions. Exposed electrical wires were found in the shower area. In one dimly lit area, prisoners were in danger of stepping out of the shower into dried blood. 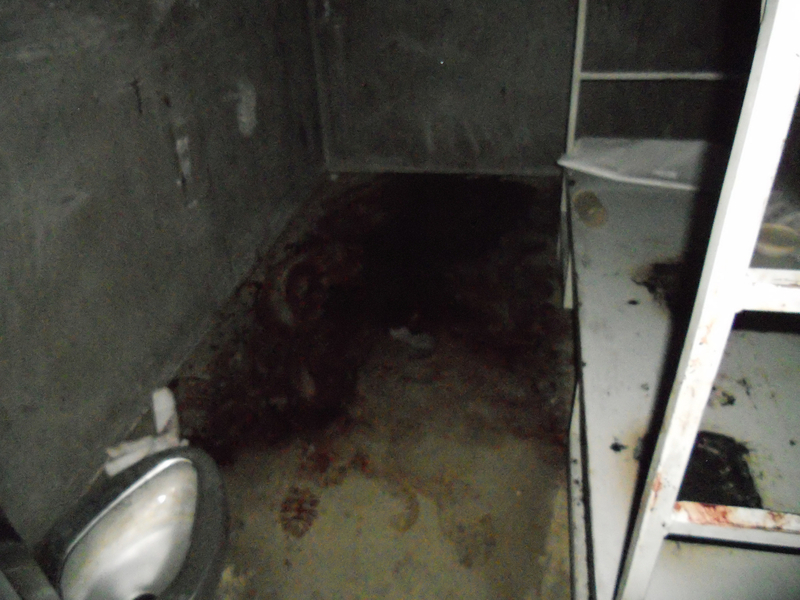 An expert touring the prison also found blood smeared on a cell window and left there for days, potentially exposing prisoners to blood-borne pathogens such as hepatitis and HIV. When an inmate worker was summoned to clean a blood-stained cell, he was not provided with protective gear to guard against such dangers. But the dangers at the prison shouldn’t be news to Management and Training Corporation. As Vail noted in his report, records from late 2012 show the company president toured the prison and found conditions in long-term segregation concerning. The pages of reports submitted to the federal court show that little has changed.